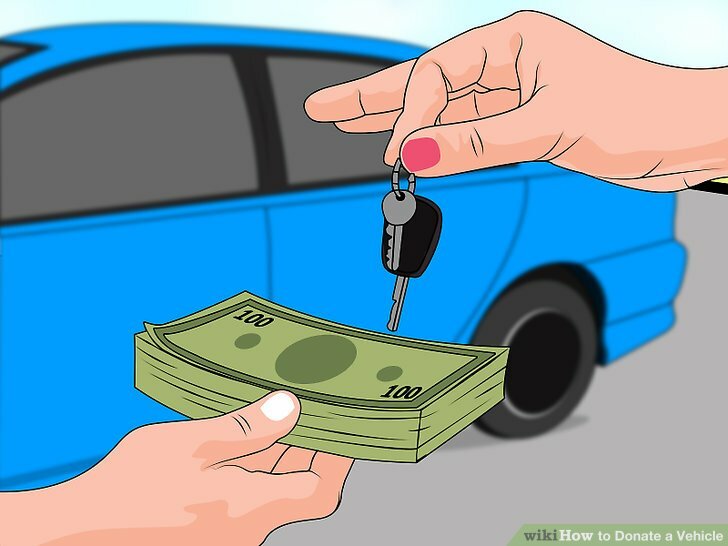 Tips Alert: How to Donate a Vehicle Car Etc. .
How to Donate a Vehicle Car Etc. .
How to Donate a Vehicle (Car Etc.) . Find charities. You should identify a charity you’d like to give your vehicle to. Go online and check the charity’s website to see if it accepts vehicles. There may also be a phone number to call or a specific web page dedicated to explaining the donation process. 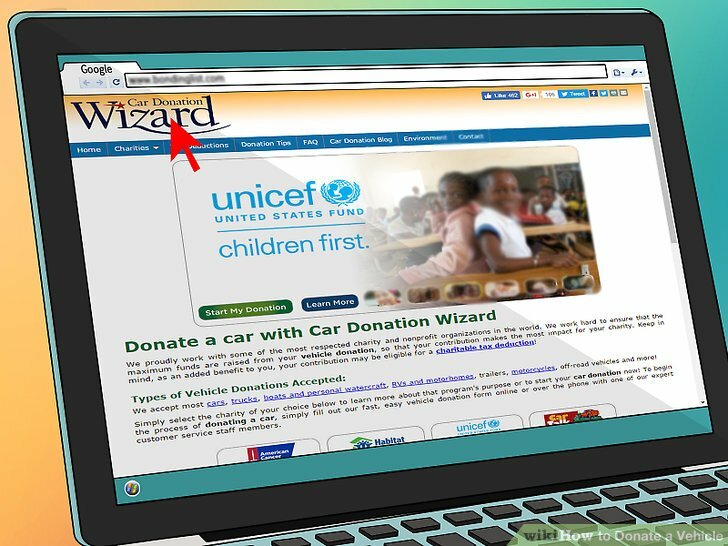 You might also use the donation wizard website at https://www.cardonationwizard.com/. You can begin the donation process on this website. Check whether the charity is a qualifying nonprofit. This is important if you want your contribution to be tax deductible. Generally, 501(c)3 charities and religious organizations qualify. You can double check by using the EO Select Check tool at https://www.irs.gov/charities-non-profits/exempt-organizations-select-check. Remember that churches won’t be listed in the IRS directory though they still qualify. You can also call toll-free (877) 829-5500 to check nonprofit status. Complete required paperwork. The paperwork you need will depend on your state. 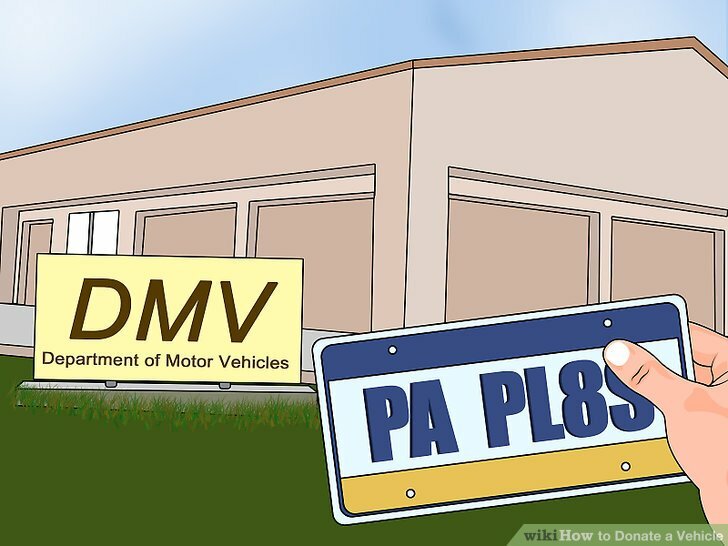 You should contact your state’s Department of Motor Vehicles and check. In most states, you will need the certificate of title to transfer the vehicle. 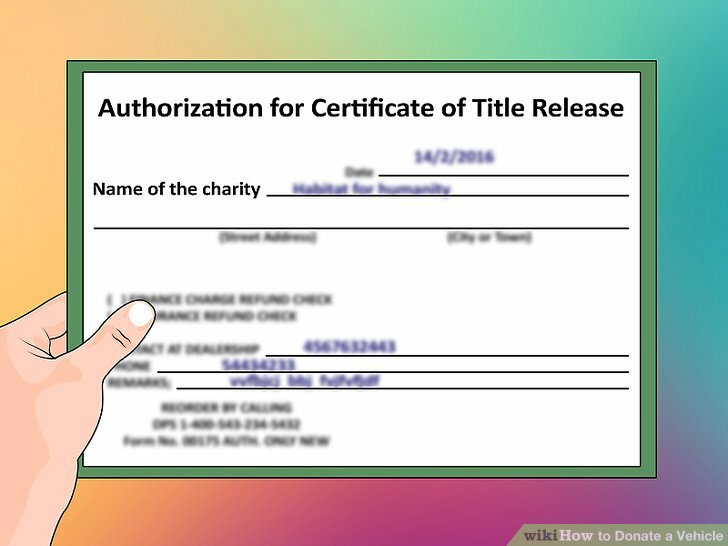 You will have to fill out the certificate of title in the name of the agency that picks up vehicles for the charity. For example, Habitat for Humanity uses “Advanced Remarketing Services,” so their name goes on the title. You also have to print and sign your name in the seller field on the certificate of title. The charity will probably also ask that you submit the title before they pick up the vehicle. Have the vehicle appraised, if necessary. 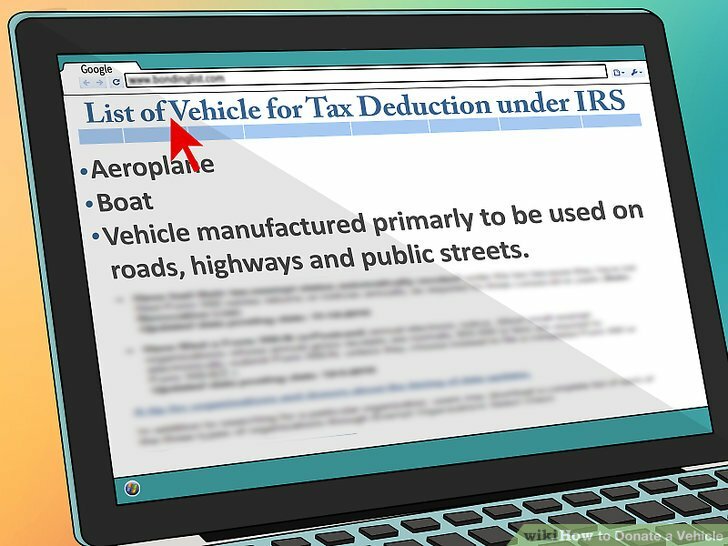 You may need to have the vehicle appraised if you intend to claim more than $5,000 as a tax deduction. 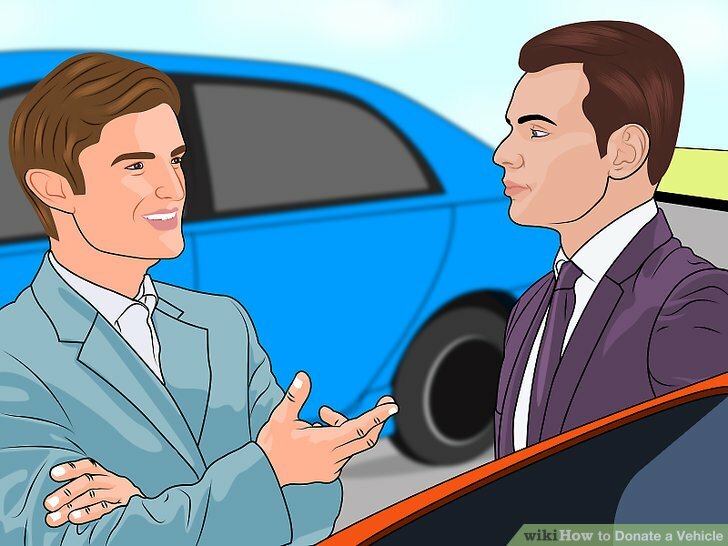 You should estimate the value of the car and talk to the charity ahead of time to find out what they intend to do with the car. You don’t need an appraisal if the charity intends to sell the car. In that situation, the sale price is proof of the car’s value. However, the charity might use the vehicle, make a substantial repair, or give it to a needy person. 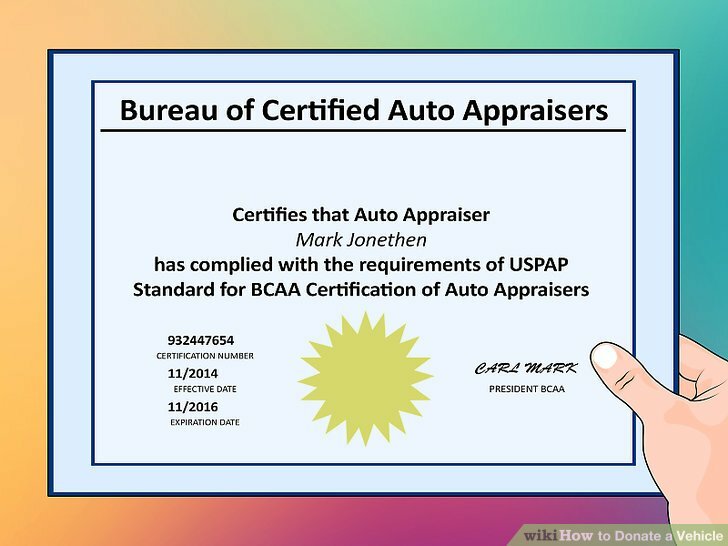 In those situations, you should have an appraisal done by a certified appraiser. Schedule a pickup. If your vehicle is accepted, you will schedule a pickup. Make sure that you are home so that you can handle any issues that might arise. Remember that the charity has up to three years to sell your vehicle. After the vehicle has been sold, you should receive an acknowledgement letter. Hold onto this letter. It contains information about the sale and can be used for tax deduction. Surrender your license plates. Each state has its own process for transferring ownership of a vehicle. Generally, you can keep your plates and use them with your new car. However, if you want to surrender them, then you can drop them off at your state’s Department of Motor Vehicles. Decide if you want to itemize your taxes. You must itemize your deductions to claim the tax deduction for donating a vehicle to charity. 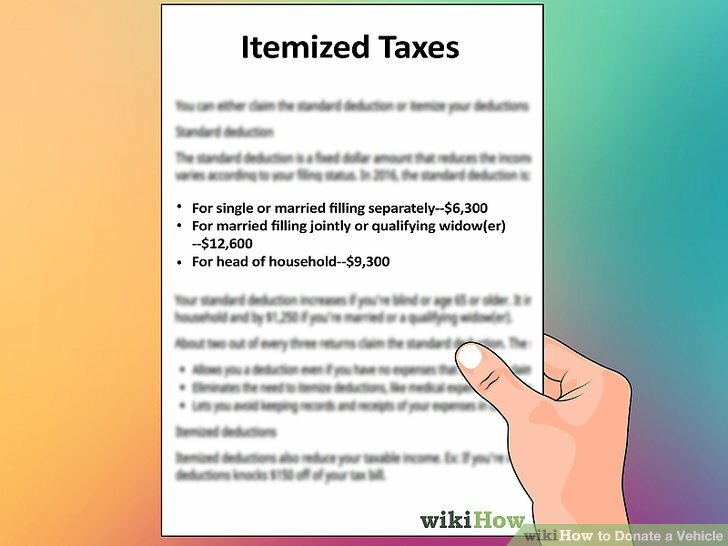 Instead of itemizing deductions, you could claim a standard deduction, which you get automatically. You should check whether you want to itemize at all. If the charity sold the car for $500 or less, then you can claim either the fair market value or $500, whichever is lower. If the charity sold the vehicle for more than $500, then you can only claim the amount sold. If the charity uses the vehicle (and doesn’t sell it), then you can claim the fair market value of the vehicle. If the charity gives the vehicle to a needy person, or sells it for an amount substantially below the market value, then you can claim fair market value. If the charity makes a “material improvement,” then you can claim fair market value. A material improvement is not a minor repair like cleaning or routine maintenance. Instead, it is a major repair, like replacing an engine. Find the vehicle’s fair market value. Fair market value is generally the amount the car would sell for in an arms-length transaction between strangers. 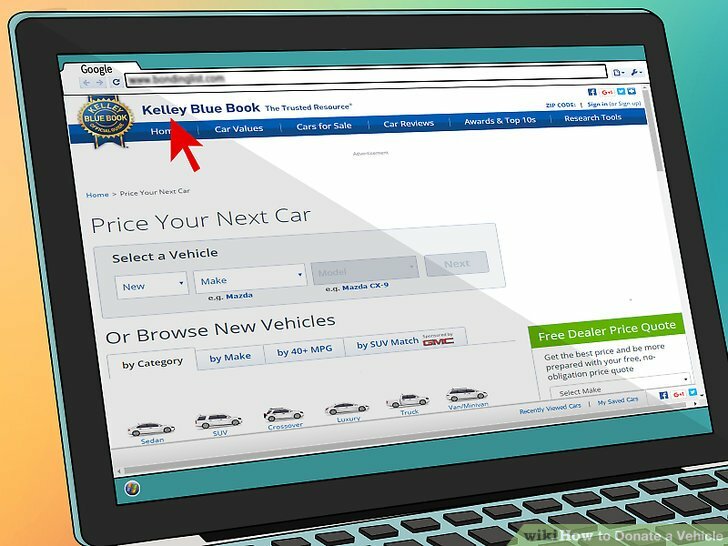 You can determine this value by using a pricing guide, such as Kelley Blue Book or NADA. You must find the value for a car of the same make, model, year, condition, and similar options or accessories. The amount you claim as fair market value cannot exceed the amount listed in the pricing guide for a private-party sale. As of 2016, the standard deduction is $6,300 for individuals, $9,300 for head of households, and $12,600 for married couples filing jointly. 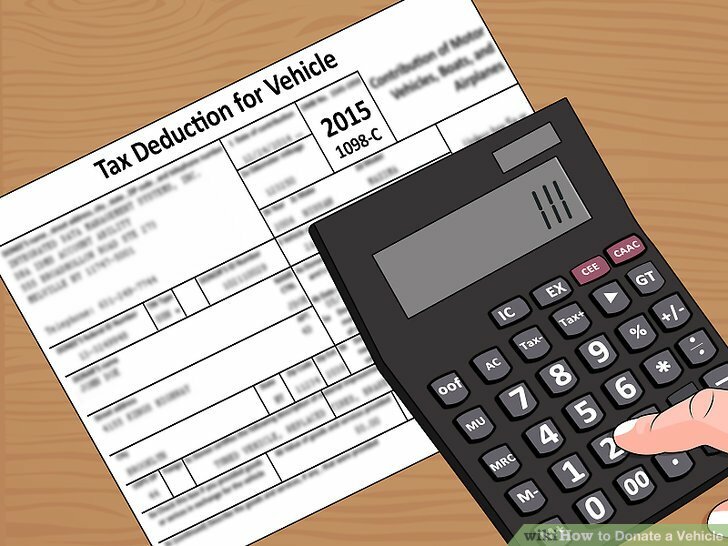 The amount you can deduct for your car may be less than what you could get with a standard deduction. For example, if the charity sells the car for $1,000, then this is less than your standard deduction. However, you might be able to itemize other deductions, such as donations to other charities, which together will total more than the standard deduction. 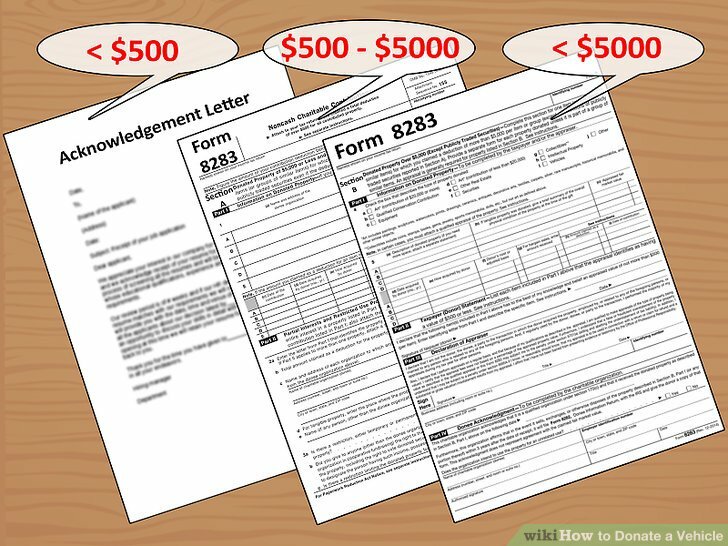 Complete Section A of Form 8283 if you are claiming more than $500 but less than $5,000. Complete Section B of Form 8283 if you are claiming more than $5,000. 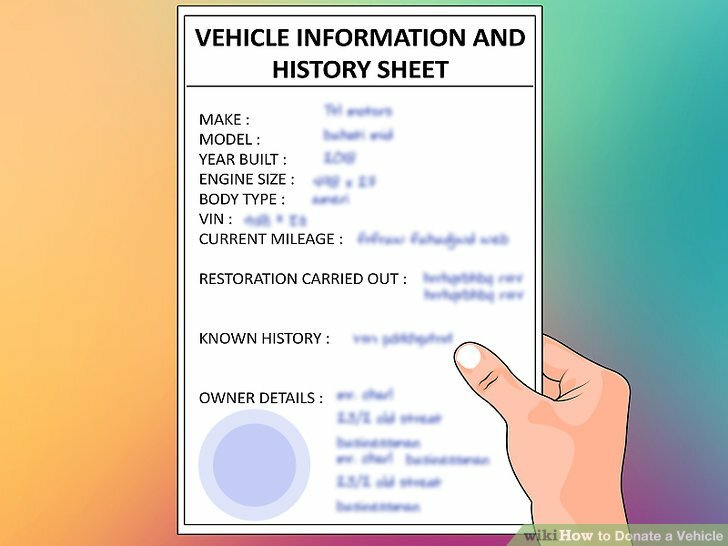 You will also need to include your appraisal unless the car was sold. Sell the vehicle yourself. You can also sell the vehicle and then donate the proceeds to the charity. You can also claim the proceeds as a tax write-off. Selling the car yourself would be an attractive option if you want to maximize the amount that you get for the vehicle. See Sell Your Used Car for more information. After you donate the money, make sure that you get an acknowledgment from the charity, which should include the charity’s name, the date of contribution, and the amount given. When I bought my used car, I was worried about this. This was my first car, and I would not want have any problem with it. For this, before buying, I checked the history of my future vehicle here https://www.faxvin.com/license-plate-lookup/nebraska it was very good to know that it was not injured and had not been hijacked before.